With netbooks, iPads, nooks, and kindles, many more of us are able to surf the internet or read a book without lugging around a bulky bag. 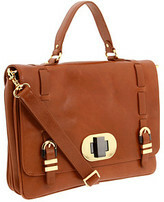 I love messenger bags because they have an old school feel while being stylish at the same time. Did I mention they're unisex? I've seen men carry these satchel style bags and if it's good enough for Gregory Peck in To Kill A Mockingbird, it's good enough for your man! I got this messenger bag and love it! Here are other options to check out! I love messenger bags. When I was at Treasure & Bond, they had the cutest men's "briefcases." I even wanted one for myself! Good collage!